Leslie Cannold is an esteemed Australian public intellectual best known for her contribution to debates over feminism and reproductive technology. I haven’t read her previous non-fiction publications What, No Baby? and The Abortion Myth but I generally read her newspaper columns and articles. This is her first fictional work. This goes some way to explain my response to the book. Cannold wanted, from the start, to mount an argument about women’s visibility in history, and the injustice of their life experience in 1st century Galilee. It is a conscious, political statement that places women back into the biblical story. The eponymous Rachael is the intelligent, headstrong younger daughter of Yosef the carpenter and his wife Miriame, and the sister of the charismatic preacher, Joshua. This slight shifting in the names unsettles our easy identification with the gospel story, and there is certainly no supernatural or religious element here at all. Her father Yosef is a good, loving man; Miriame is a carping, bitter woman and certainly no saintly figure; her brother Joshua changes from a quietly empathetic ally into a somewhat fey, distant figure, driven by his own obsessions and agendas. Rachael, conscious from the start of her difference and chafing against the many restrictions placed on women, becomes an acolyte of ‘the crone’ Bindy, who initiates her into the women’s arts of healing. She falls in love and marries Judah of Iscariot, rebel leader of a guerilla band that is resisting the Roman authorities. She struggles with the pressures to have a baby and yet continue her work as a healer. The anachronisms started early- on the second page in fact, with the ‘Galilean resistance fighters’ (shades of Monty Python’s Judean People’s Front??) and Rachael’s mindset is a thoroughly twenty-first century one. The book is obviously well researched, especially the details of women’s medicine and herbalism, but the research is conveyed with a heavy hand. The book reminded me of Anita Diamant’s The Red Tent, but it has none of the rich female intimacy that marked that book. 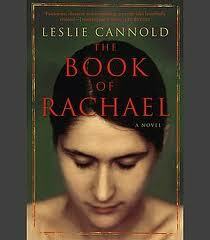 The Book of Rachael is a book of the head that mounts an aetheistic alternative narrative to the gospel. Perhaps it could be described as an extended, fictionalized ‘what-if’ argument. As a reader I found myself watching how the argument was constructed, weighing it and judging how well it countered the gospel account. The reviews I have read of this book are generally glowing. Lisa at ANZLit Lovers wrote one of the most enthusiastic reviews I’ve ever seen her give; Kylie Ladd on Mamamia liked it too, as did Theo Chapman in the SMH and Patricia Maundel on Radio National’s Bookshow. I’m afraid that I have to disagree. This entry was posted in Australian literature, Australian Women's Writing, Book reviews. Bookmark the permalink.